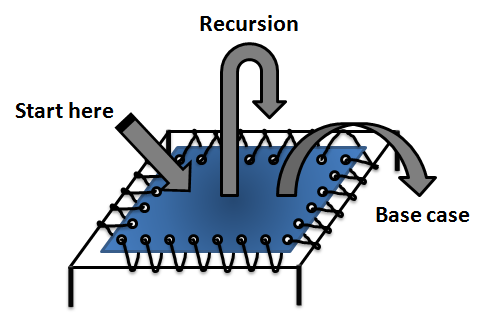 Recursion is a widely known technique to decompose a problem in smaller “instances” of the same problem. For example, performing tree operations (e.g. in the context of data structures, user interfaces, hierarchical stores, XML, etc) can be expressed in terms of a navigation strategy over the tree where one performs the same operation to subtrees. A base case takes care of the algorithm’s “bounding”; in case of tree operations that role is played by the leaf nodes of the tree. Because of the heap-allocated nature of a closure, we can pass it around – including all of its “context” – to other locations in the code, potentially lower on the call stack. Let’s not go there, but focus on the little null-assignment trick we had to play here. Turns out we can eliminate this. To see how the Fix method works, step through it, feeding it our factorial definition. The mechanics of it are less interesting in the context of this blog post, suffice to say it can be done. By the way, this Fix method is inspired by the Y combinator, a fixpoint combinator created by lambda calculus high priests. That doesn’t look too good, does it? All the magic that Fix did was to realize the recursion, but we’re still using recursive calls to compute the value. After some 5000 recursive calls, the call stack blew up. Clearly we need to do something if we are to avoid this, whilst staying in the comfort zone of recursive algorithm implementations. One such technique is a trampoline. But before we go there, it’s worthwhile to talk about tail calls. Don’t stand on my tail! Wonderful, isn’t it? While we preserved a recursive definition, we really got the performance of an imperative loop-construct and are not exhausting the call stack in any way. The C# compiler on the other hand wouldn’t figure this out. In what follows, we will be using this definition of factorial in combination with a trampoline to realize the same kind of stack-friendly recursion in C#. One main characteristics of trampolines is that they bounce back. Jump on them and you’ll be catapulted in the air because you’re given a kinetic energy boost. While in the air you can make funny transformations (corresponding to the body of the recursive function as we shall see), but in the end you’ll end up on the trampoline again. The whole cycle repeats till you run out of energy and just stay at rest on the trampoline. That state will correspond to the end of the recursion. This all may sound very vague but things will become clear in a moment. The core idea of a trampoline is to throw a (recursive) function call on a trampoline, let it compute and have it land on the trampoline with a new function. It’s important to see that both the function and its arguments are jumping on there. Compare it to an acrobat that jumps on the trampoline and counts down every time he bounces. The function is the acrobat, the argument is the counter he maintains. When that counter reaches a base case, the breaks from the bouncing by carefully landing next to the trampoline. This will just print 10 Go! messages. 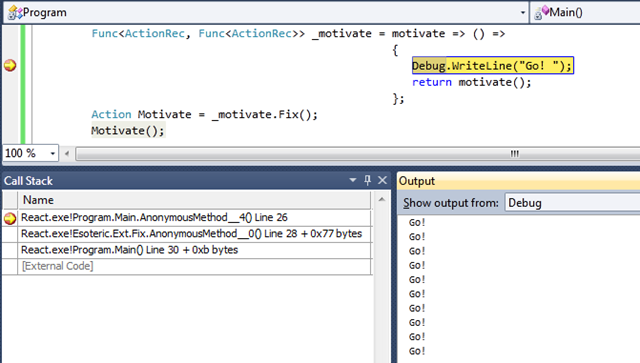 Notice I’ve omitted an intermediate variable for the f.Fix() result and call the resulting Action delegate in one go. 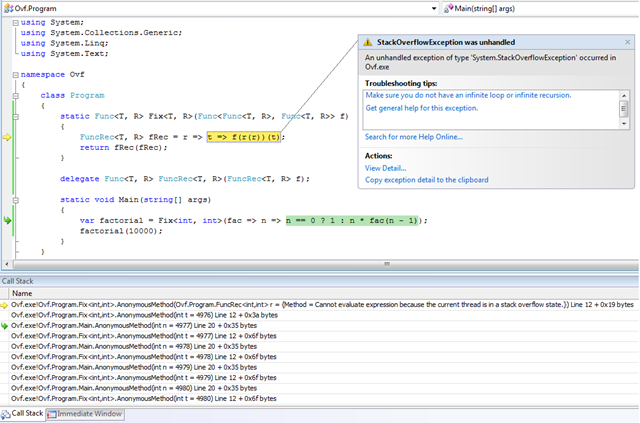 Notice we’re cheating a bit by using a captured outer local variable to restrict the number of recursive calls. It’s left as an exercise to the reader to define another such recursive function where the input parameter is used to represent the “to” argument, i.e. specifying the largest exponent to calculate a power of two for. In Main, we called the fixed delegate with arguments 0 and 1. This caused us to enter the outermost lambda expression in Fix with t1 and t2 respectively set to 0 and 1. This is the second frame on the call stack (read from the bottom). 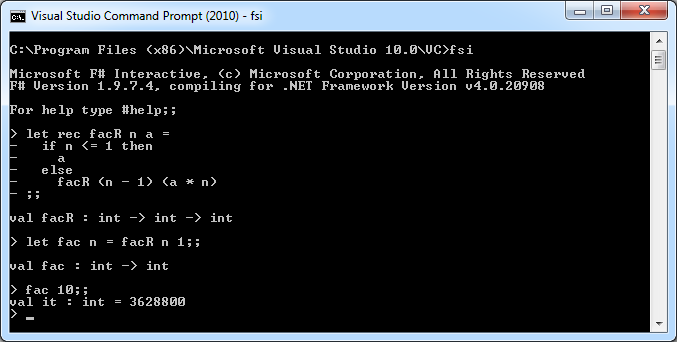 The for-loop has proceeded to the first call of its update expression, resulting in a call to f with argument a and a subsequent invocation on the result with arguments 0 and 1. As a result, our lambda expression, lexically nested in the Main method, got called as observed by the third frame on the call stack, with x and y respectively set to 0 and 1. Here the recursive call happens by invoking the a delegate with arguments 1 (x + 1) and 2 (y * 2). Finally, this put us back in the trampoline where those two values will be captured in t1 and t2, and that’s where the debugger is currently sitting. Moving on from here, we’ll back out of the trampoline and return the result of the apparent recursive call on “a” from lambda “f” in Main. This by itself puts us back in the driver for-loop, where “a” will be tested for null (which it isn’t yet) and the whole cycle starts again. This illustrates the key essence of the trampoline: instead of having the user directly causing a recursive call, callbacks to the trampoline code cause it to capture enough state information to make the call later on. This effectively flattens recursive calls into the for-loop. What we lost is the ability to do work after the recursive call returns (something we could work around by getting into the land of continuations). The essential tricks to deal with input parameters have been explored above. However, Func delegate types have one more property we haven’t investigated just yet: the ability to return a value. 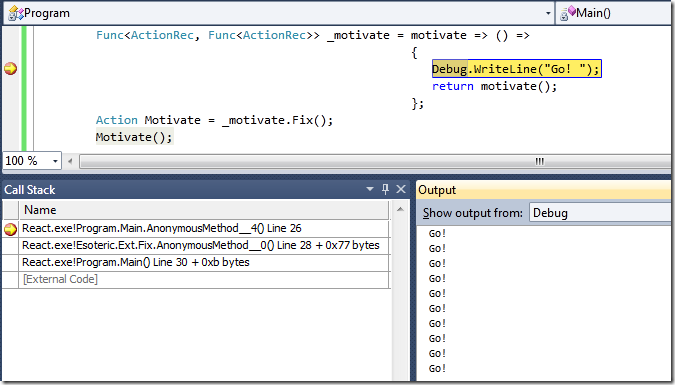 We’ve seen the Break method before, but for Action delegates it doesn’t do anything but returning null. In case of recursive Func types, we’ll have to do something in addition to this, in order to return an object to the caller. What’s happening inside those Break methods will be discussed further on. 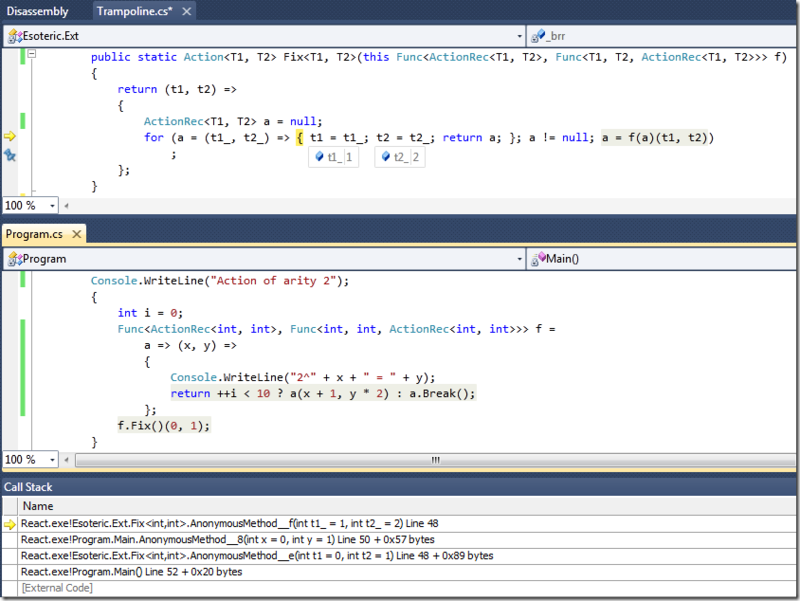 For now, it suffices to see the signatures, taking in an R parameter to hold the return value of the recursive call. 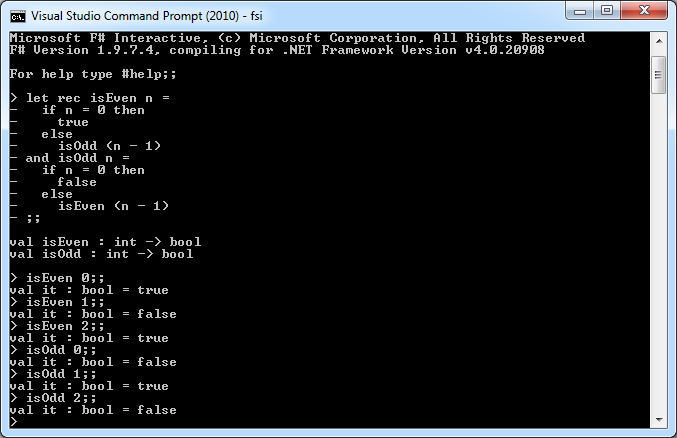 Also notice how those methods return “a” instead of null. We bound the recursion again by means of some outer local variable, but this is not a requirement. But in order to show all functions without one running away, such a bound is desirable. 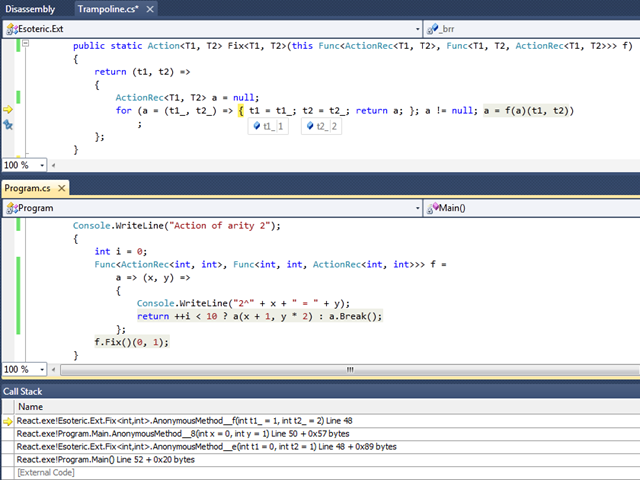 Concerning the input parameters, things look identical to the ActionRec samples. What’s different are the Break calls and the output types specified in the FuncRec type parameters. We’ve simply used the bounding variable “i” as the return value for illustration purposes. Later, when we see factorial again, the output value will be more interesting. // but can't derive from Delegate manually in C#... This is "brr". Break add the return value to this dictionary, while the trampoline driver loop checks for such a value repeatedly. 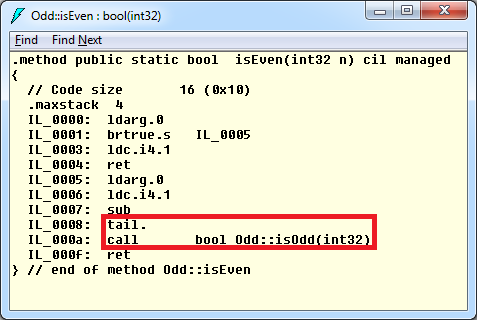 If one is found, a Break call has been done and the loop terminates, stopping the recursion and sending the answer to the caller. Alternative potentially cleaner tricks can be thought of, but I haven’t spent much more time thinking about this. Beautiful! 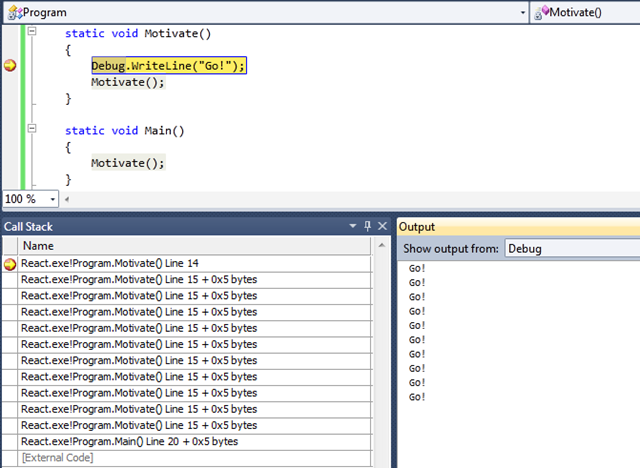 Almost reads like a regular C# method declaration (with plenty of imagination the author possesses). It also illustrates how the trampoline is sandwiched between our call to the recursive function (f.Fix()()) and the callback to the code we wrote (f). 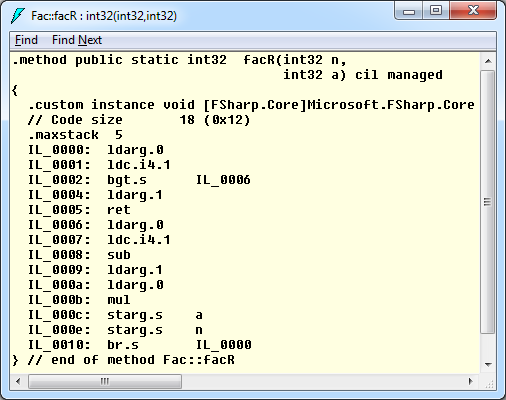 Tail calls reuse the current stack frame, therefore not exhausting the stack upon recursion. The same can be achieved by means of a trampoline if you’re brave enough to give it a try. 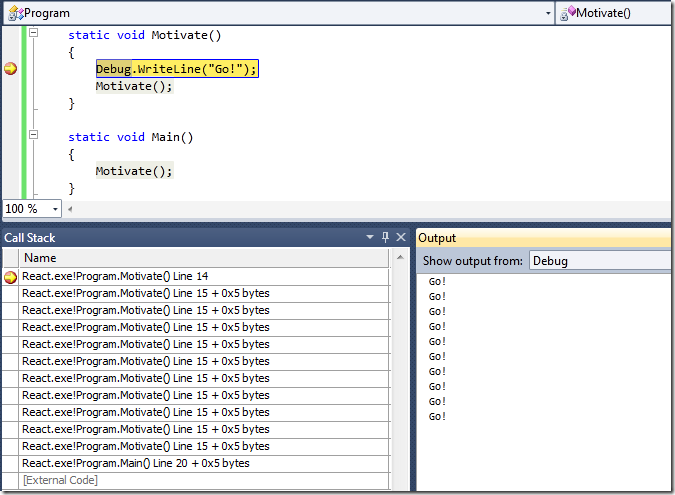 Hint: notice how mutually recursive functions in F# are subtly bundled by means of an “and” keyword. How would you realize exactly the code above, using trampolines and whatnot, without exhausting call stack space? Recall the problem with the above is the fact we need to do a multiplication after the recursive fac call returns. Hint: think of continuations and maybe even the typical “von Neumann machine trade-off” between code (CPU) and data (memory). Now I know my Y-combinator is inadequate. Please, please, please tell me to what extent I can reuse this code. What license is it under? Thanks for bending my mind! My Y-combinator now seems inadequate. Any word on what license this code is under for reuse purposes? Fibonacci on a Trampoline? Maybe as a "homework" ? You can use this code wherever you see fit; just keep a reference to this post in there. Also beware it hasn't been properly tested and is merely an illustration of a technique rather than a definitive implementation thereof. Also I think the 'for' (or more generally while(true)) pattern wont exactly cut it for any more complex than factorial. 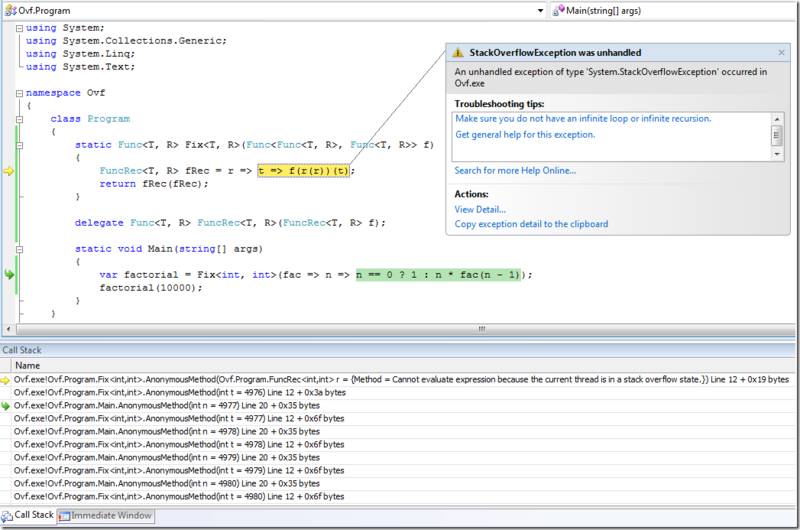 For example, the 'break' pattern will not allow for a non-local exit unless you use Exceptions to jump to the top. # Rx Schedulers &#8211; Reverse Trampoline &laquo; Enumerate this! Friday, February 11, 2011 7:35 AM by Rx Schedulers – Reverse Trampoline « Enumerate this! Pingback from Rx Schedulers &#8211; Reverse Trampoline &laquo; Enumerate this!